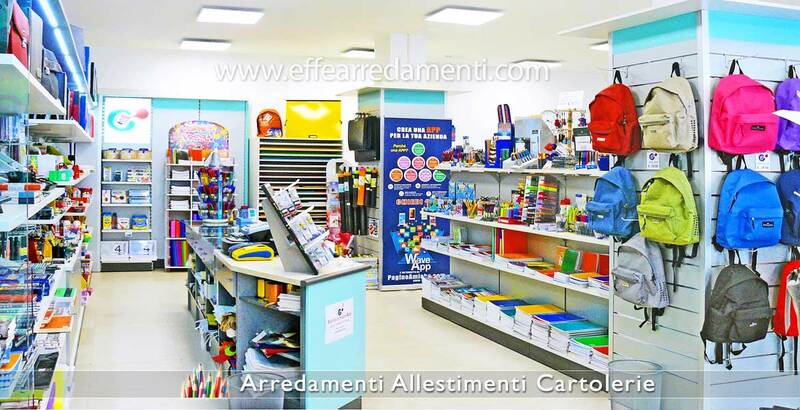 Effe Arredamenti proposes a system of furnishings for stationery and cartolibrerie which was created to solve all the needs related to the retail distribution of office items, for school, school textbooks, gift items, and so on. Our solutions are designed to give the right place to each of your products. We have designed a complete set of accessories and elements such as equipped walls and central elements, drawers and display cabinets to enhance the most precious items for you and to create environments where the items are exposed to the best. 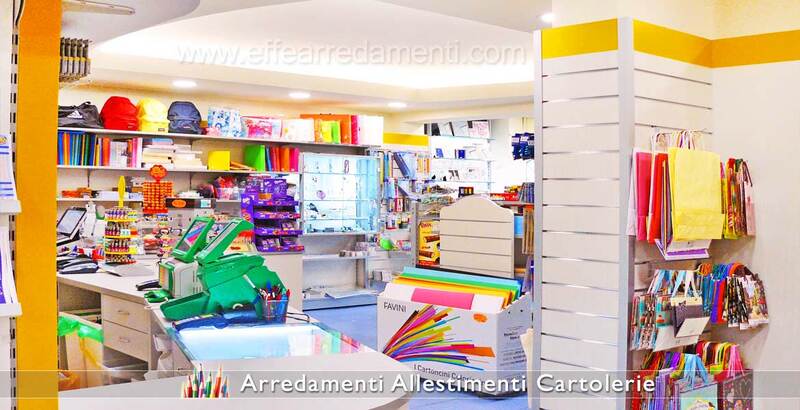 Naturally Effe Arredamenti also creates and deals with fittings and furnishings for copy shops, stationery and stationery stores, etc. 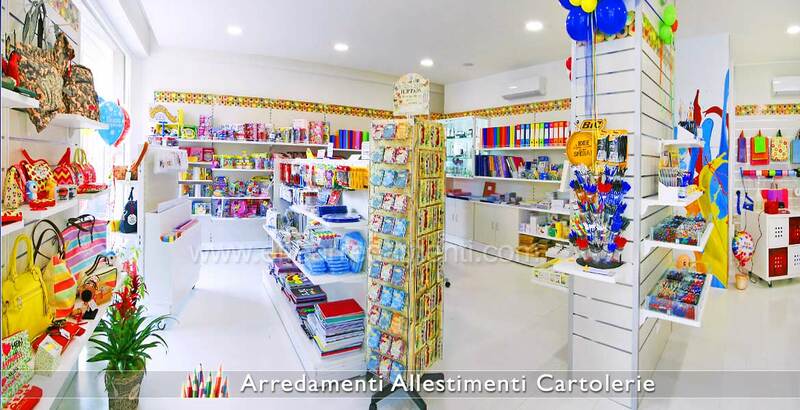 if devi Furnish a Stationery or Cartolibreria, or open or renew, do not wait, contact us! 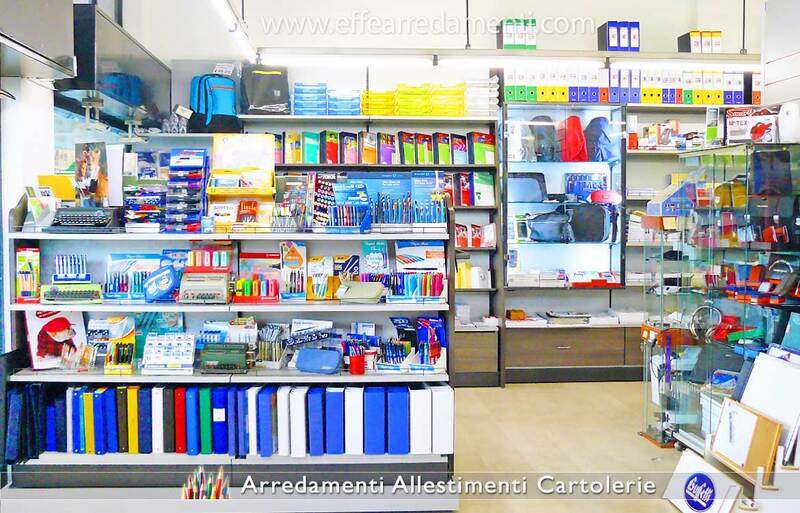 Photo n. 010 - Effe Arredamenti: Furniture and complete set-up for this elegant stationery stationery shop of 40 square meters built in Pesaro. The furniture is characterized by the colors, oak wood parts, satin aluminum metal parts, red laminate finishes. The photograph was taken immediately after opening, at a later time the stationery was furnished with display gondolas, both in the center of the room and inside the window. Photo n. 013 - Complete set-up for stationery and technical stationery for the sale of products and services such as school textbooks, stationery, stamps, stamps, printer cartridges and all products concerning school items and offices. Realization carried out in Milan. Photo n. 015 - Effe Arredamenti has created this stationery in Milan; in the photograph there is the cash desk, the back counter made up of a modular equipped wall with furniture at the base with doors, height-adjustable shelves, height adjustable hooks, hooks / blisters, pen holder, pencils, erasers, etc. The wooden parts are in white lime and the finishes of a nice, striking orange color. 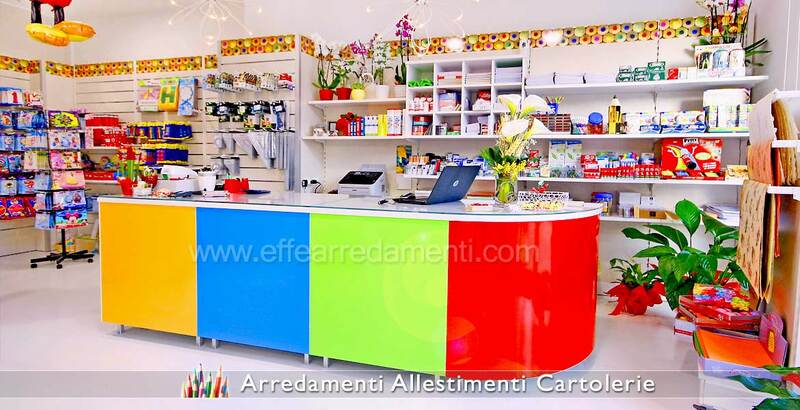 Photo n. 019 - Effe Arredamenti has created this furniture for stationery and receiving office in Rimini. To be noted, in the foreground, the cash desk, the slatted wall that can be equipped according to your needs, the gondola headboard that can be equally equipped, the wall equipped to contain any type of product. Photo n. 020 - Effe Arredamenti has designed, produced and set up this complete furniture for technical stationery in Rimini. Note on the right the exhibition column for backpacks, the exhibition gondola for notebooks and stationery and the equipped wall on the background and on the side, the result is a well-organized stationery, well-designed spaces and paths, the products are best exposed handy and are clearly visible. Photo n. 025 - In photography, the backpacks department of a large stationery shop. In the foreground modular bilateral gondolas (to get the maximum exposure with the minimum space) for the exposure of backpacks, cases and diaries for the school. Photo n. 030 - As you can see in this photograph, yellow dominates nicely on the other colors, thanks to a well-studied combination of colors, bright yellow, light lime and anthracite. 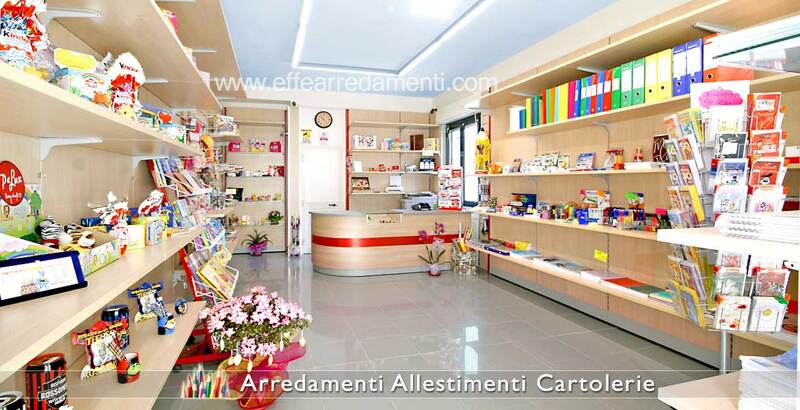 This stationery, tobacconist and book store has been entirely designed and built by Effe Arredamenti. In the foreground, modular gondolas with adjustable shelves at your pleasure and dividers for pens, pencils, erasers and other stationery. In the background, modular wall furniture in which the column is also provided, plus modules for the receipt for the compilation of coupons and scratch cards, back panels (dividing elements of the gondolas and wall elements) of glossy lacquered yellow color, with anthracite colored metal parts. Photo n. 040 - Equipped wall ideal for stationery shops and stationery shops. 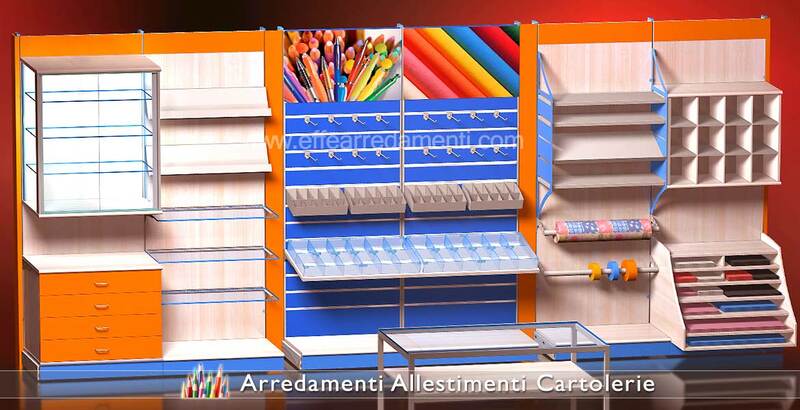 Starting from the left the wall is composed of: modular elements with base, base drawer unit, upright coupling display case with lighting and glass tops, notebooks and magazine rack display units, tops with rubber pencils pens and stationery dividers. Also hooks for display teams, rulers, etc . ; display rack for notebooks, display rack for ribbons and paper for gift packs, mobile display stand for bristol sheets, display unit with honeycomb hooking upright. Photo n. 050 - Equipped wall ideal for stationery shops and stationery shops. Starting from the left the wall is composed of: modular elements with base, base drawer unit, upright glazing window with lighting and glass tops, notebooks and magazine holders, shelves with divider pens, rubber pencils and stationery, hooks for display squares, rulers etc., display rack for notebooks, display for tapes and paper for gift packs, mobile display stand for bristol sheets, display unit with honeycomb hooking upright. Photo n. 060 - Focus exhibition wall of stationery items and products for the school, well ordered products and organized thanks to a furniture that allows exposure and change of exposure according to your desire. Photo n. 070 - In San Marino, Effe Arredamenti has created this exhibition wall made up largely of display windows that are individually lit for stationery products that you care about most, which need to be clearly visible but at the same time protected. Photo n. 080 - In the three photographs, Effe Arredamenti has created these display walls with both straight and inclined shelves and tops with dividers. On the right showcases protected and high exposure of backpacks. Photo n. 090 - In the beautiful photograph an example of furniture without exposed goods, so as to be able to realize the structure of the furniture itself. This furniture, in particular, is located at the our show-room, that you are welcome to visit. Photo n. 100 - Furniture for stationery shops: In these three photographs, on the left a well-lit display cabinet, in the middle an exhibition wall, on the right a one-sided gondola to make the most of the spaces, with height adjustable shelves. 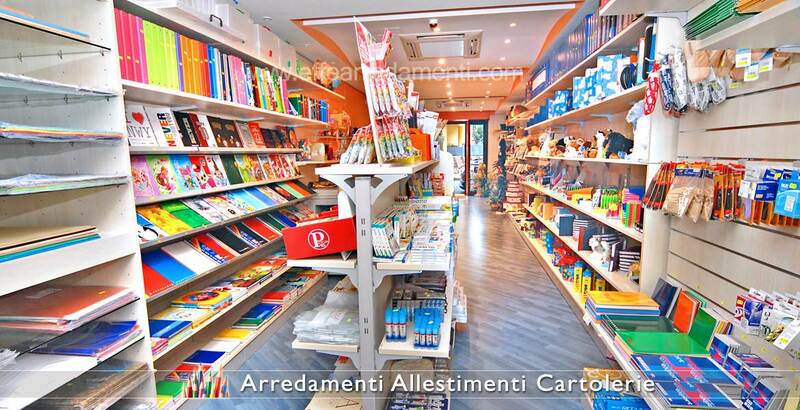 Photo n. 110 - Effe Arredamenti has created this stationery and cartolibreria shop in Benevento. On large wall-mounted shelves you can display your larger items. The cash desk is nicely surrounded by exhibition areas and drawers for reserve goods. 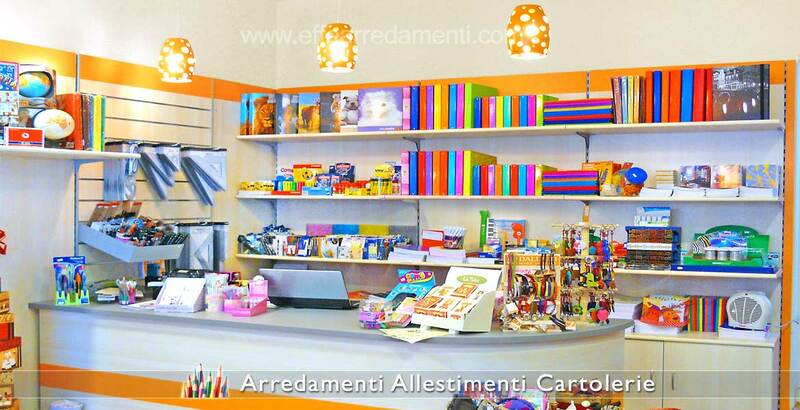 Photo n. 120 - In photography, furniture of a stationery shop by Effe Arredamenti in Città di Castello in Umbria. As you can see, the furniture is enveloping compared to the visitor, and allows you to best show the toy department in this case. The relative heaviness of the exposed goods advised us to use shelves and backs in cream-colored metal in this case. Photo n 130 - In this beautiful photograph, cash desk in many colors, perfect to satisfy the sense of sight. On the background equipped walls and exhibitors. The environment, as we can see, can be suitably revived also by floral compositions or plants. Photo n 140 - In beautiful photography, a set of stationery shop and stationery shop. In the foreground you can see the equipped column exhibiting at its best, as well as a mobile display on wheels. The walls equipped to display your goods complete the picture. 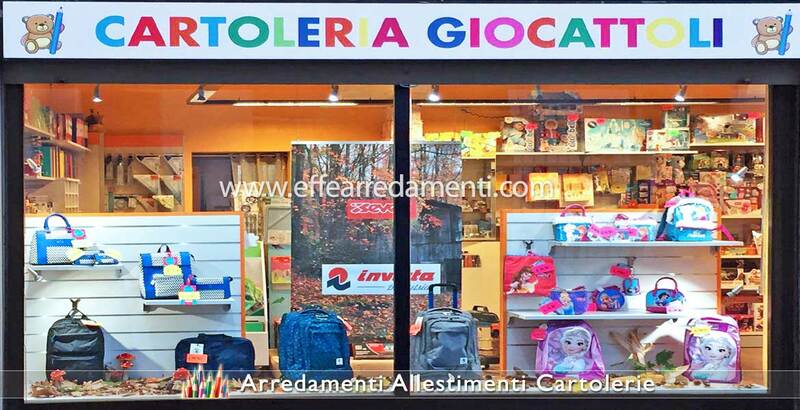 Photo n 145 - Effe Arredamenti has created in Milan this beautiful showcase for stationery and toy store, where you can see the main products and items that you will find on display in the shop: backpacks and toys, as well as a nice banner ad. Photo n 150 - Furniture for cartolibreria made up of walls with aluminum slats (on which accessories can be inserted), and containers for inclined or straight objects in plastic. Pen holder, pencil holder, highlighters, rulers and drawing instruments for the school. With our furniture your kids have everything they need for school! Photo n 160 - In this close-up photograph, plane with dividers and containers for pens, pencils and stationery for school and office.